London is my Campus is an app design competition bringing together universities and colleges across London to improve the experience of students studying in the capital. Students from the 24 participating institutions were invited to submit a video application highlighting their skills and app ideas. 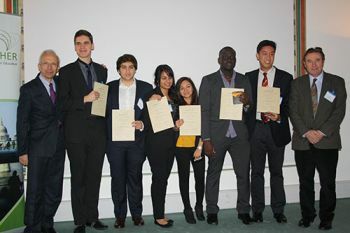 The best six were then selected to be part of a small team tasked with creating a mobile app aimed at London students. Benjamin Lioue who spent a term at City University London as part of the Study Abroad Programme was one of the top-rated applicants selected to join the final team. Speaking about the app concept, Benjamin said: "One of the problems London students face is that there is no platform allowing students to find out everything that's going on across the capital. The app we have designed will bring all student specific activities together in one place and tailor them to suit your interests, location and university. It also allows you to connect with friends to share events and find out whether they are attending." The winning applicants attended a mentoring workshop hosted by experts where they developed the app further. Along with over 70 academics, technical experts and stakeholders, the student team were then invited to attend a prize giving reception held at Chancellor's Hall in the University of London. "Winning was an amazing opportunity to work with other students and create an app concept that will revolutionise the student experience," says Benjamin. "I entered the London is my Campus competition because I wanted to help tackle some of the issues students in London face. I'm looking forward to the next stage, which involves a lunch meeting with Google's app development team who will be giving us advice, support and insight." Benjamin was also awarded a prize at the CitySpark festive marketplace for his innovative app idea Students Eat.